IBEW 1245 began preparing for the Janus v AFSCME decision more than a year in advance. Working closely with our organizing team and public sector business representatives, our member-led Voluntary Organizing Committees (VOCs) meticulously planned and flawlessly executed a highly effective campaign to reach out to their co-workers, tell them about the importance of keeping the union strong, and encourage them to commit to maintaining their union membership in the face of this anti-union Supreme Court case. Our program was so effective that it soon became a model for other local unions to follow suit. In May, our sister local in Los Angeles, IBEW Local 11, in conjunction with the LA/OC Build Trades Council and the LA County Federation of Labor, reached out to Local 1245 for help with a massive organizing blitz to sign up and recommit their members in the public sector. As always, Local 1245 Business Manager Tom Dalzell and the organizing team heeded the call, and dispatched four of our own VOC leaders to Los Angeles for the week-long blitz. 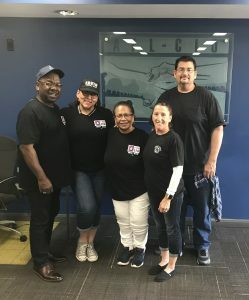 Kim Camatti (SMUD), Mike Patterson (City of Oakland), Dave Williams (City of Redding), and Darla West (SRT) traveled to LA in early May to support Local 11 and the Building Trades in their blitz, and together, they succeeded in helping to re-commit more than 1,000 members to the union. Each day of the trip, from before dawn until after dusk, the 1245 VOC leaders set out to talk with workers about the union, explain Janus, answer their questions, and invite them to recommit or sign up. Their grueling schedule began at 4:45am in the morning, but their diligence kept them invigorated. “For me, the best part was talking to people one-on-one and explaining the importance of the issues and how important it is to be a union member,” said Michael Patterson. By sharing their stories and discussing the contract improvements they’ve won, the benefits they’ve maintained, and the issues they still want to tackle, they were able to connect with a broad cross-section of workers who were not signed up as union members. They also got down to brass tacks with the fee payers, and discovered that many of them didn’t even realize that they weren’t full union members. Their trip to LA solidified their commitment to Local 1245, and helped them realize that their home local truly sets the standard when it comes to building union strength through internal organizing. LA County Federation of Labor President Rusty Hicks expressed his appreciation to Local 1245 in a heartfelt thank-you letter. Keeping the Labor Movement strong in the face of Janus will, without question, involve some hard work, but it is do-able. Together, we can and will continue to build a stronger movement through member engagement.